The authors are donating all of their proceeds from book sales to the Saint Judes Childrens Research Hospital. Sensei Carl and Dr. Gettis thank everyone for their interest, and hope that this book will provide a positive and supportive experience to all interested in Zen, and to all who hope to "embrace life as it is". Clear Mountain Zendo partnered with the National Council of Jewish Women of Essex (NCJW/Essex) in holding a November food drive to support the "Empty Bowls No More" anti-hunger initiative. Gail Sample of NCJW/Essex thanks everyone from Clear Mountain who donated food items for the Thanksgiving food drive or feminine hygiene products for their Period Project. Gail recently told the sangha that the collection will continue year-round; anyone can donate food or hygiene products at any time during the upcoming Sunday zazen sittings. The need amidst the Essex County community for food and hygiene support does not diminish after Thanksgiving, of course. In keeping with Buddha's teachings on compassion, we encourage our sangha to keep in mind this opportunity to help the less fortunate during the upcoming year-end holiday celebration, and on into the new year. Take-home food items are distributed to needy families and individuals through the NCJW Center for Women in Livingston, and through the West Orange Food Pantry, which is located at the Holy Trinity Church, 315 Main Street, West Orange. This Pantry helps to feed between 300 and 500 people per month, and operates in conjunction with Christine's Kitchen, a hot meal program. Sangha members wishing to support this initiative can bring food items to be collected at our zendo. We welcome dry packaged or canned food items that are non-perishable, unopened and unexpired. Supermarket gift cards are also welcomed. Some examples of appropriate food items include: canned soups, pasta, meat, fruit and vegetables; coffee and tea; peanut butter and jelly; catsup and mayonnaise; canned pork and beans; pasta; bagged rice; canned tuna; bottled juice or juice boxes; cereal; napkins, tissue and toilet paper; baby food; diapers size 3, 4 or 5; toothpaste; and shampoo. we are only allowed to accept unopened, unexpired food items, for health reasons. In addition, the West Orange Food Pantry has requested holiday foods including canned yams, cranberry sauce, canned turkey gravy, and stuffing mix. Clear Mountain is also supporting the NCJW/Essex Period.Project, which provides advocacy and awareness regarding the barriers that many women face in obtaining feminine hygiene products. Women can spend $75-$125 each year on feminine hygiene products, but lower-income women often have trouble given that neither food stamps nor health insurance can be used to help pay for these items. Therefore, women report missing work and school due to their lack of access to them. 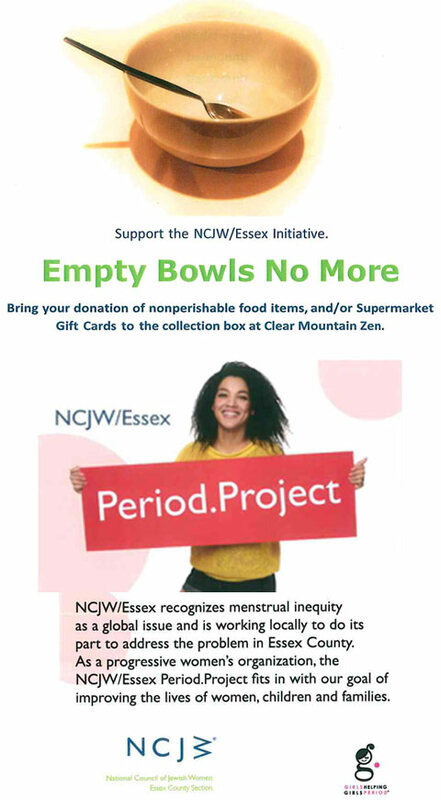 In order to support NCJW/Essex's Period.Project, Clear Mountain Zendo is also be accepting donations of packaged feminine pads and tampons. You can usually purchase these at the same supermarket where you would pick up food items for our food drive. These will be distributed by NCJW in partnership with local community service agencies and through its Center for Women at 70 South Orange Avenue, Livingston, NJ. The National Council of Jewish Women (NCJW) is a grassroots organization of volunteers and advocates who turn progressive ideals into action. Inspired by Jewish values, NCJW strives for social justice by improving the quality of life for women, children and families and by safeguarding individual rights and freedoms. With more than 3,000 members, NCJW/Essex is the largest of nearly 100 regional sections around the country. Founded in 1912, our Essex section is a collaboration of executive committee members, board members, professional staff, dozens of committee chairs, and hundreds of active volunteers. We serve Essex County as well as the surrounding region, and all of our programs and services are non-sectarian. Clear Mountain Zendo looks forward to continued partnership in social engagement with the NCJW/Essex. 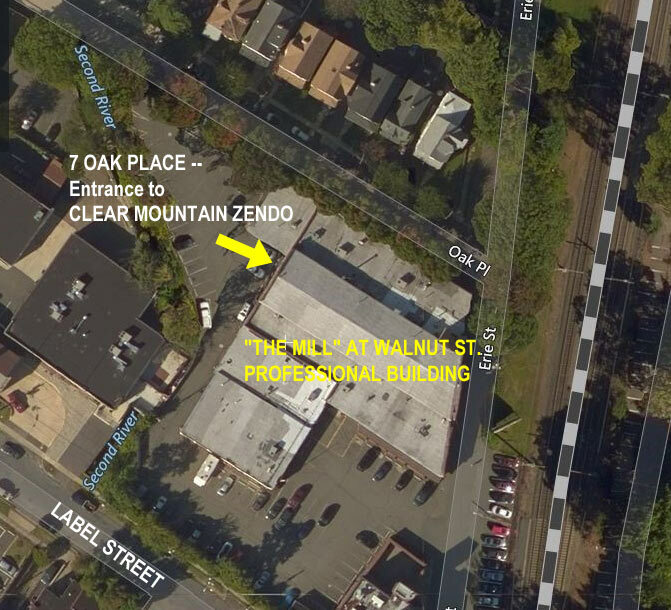 On January 15, 2017, after approximately 10 years at a storefront location on Lackawanna Plaza in Montclair, Clear Mountain Zendo moved to its present location, which is at 7 Oak Place in Montclair. We are located in an office suite on the ground floor of "The Mill at Walnut Street" professional center, a former knitting mill that was converted to office space. This building is near the NJ Transit Walnut Street train station on the Montclair-Boonton Line (it is on the same side that the restaurant / former train station is located, just a few hundred yards to the north; for long-term Montclarians, "it's near the former State inspection station"). 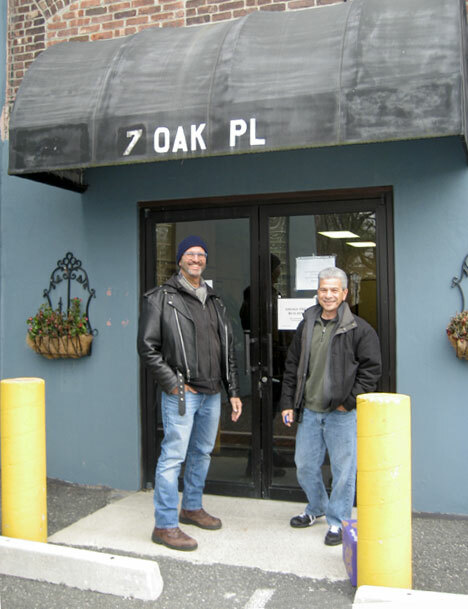 The building has several entrances; our zendo can only be accessed via the 7 Oak Place doorway, which is in the northwest quadrant of the building, facing away from the railroad line and closest to Oak Place. There will be adequate off-street parking available at the center for our members during non-business hours, i.e. on weekends. On week days, our members may only park in the lot before 9 am and after 6 pm, which is when most of our weekday activities take place. Below you can find a map and two aerial photos to help you find our building and locate our entrance (at the arrow), along with a photo of Head Monk Jeff Kuschner and Mark standing at the doorway, and Sensei Carl Bachmann with some of our members inside our new home. Although we will greatly miss our former Lackawanna Plaza home, which served us well, our new location is larger and offers more flexibility such as seperate rooms for daisan discussions, a library, and a small coffee pantry. Our schedule and that of our affiliate space users will remain the same at the new location (with the eventual potential for an expansion of our activities). Various members of our sangha have established practices in other traditions that are related to Zen, including yoga. One such member, Elizabeth Pagan, is a certified Iyengar yoga teacher who offers weekly classes at the Oakeside Cultural Center in Bloomfield, NJ. Iyengar emphasizes precise, careful body alignment, maximum spinal extension and balanced development of muscular flexibility, strength and stamina. Elizabeth's classes are held on Monday evenings between 7:30 and 8:45 pm. For more information and costs, please see the website announcement at oakeside.org/programs/. Elizabeth can also be contacted at lizpagan@verizon.net. For more on the Iyengar yoga tradition, see iyanus.org. In September of 2018, a new meditation group will begin using the Clear Mountain Zen Center, usually once a month, from 7:30 to 9 PM. 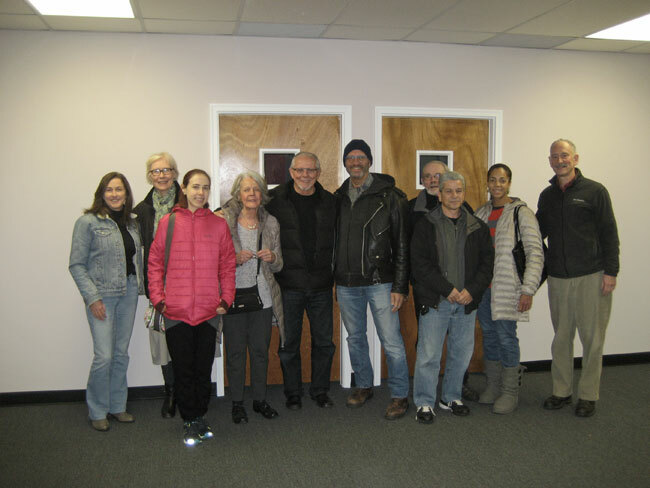 From December 2018 on, the group will meet and sit on the third Thursday of each month. In September, the first meeting for the group will be held on Thursday, Sept. 6 from 7:30 to 9:00 PM. There won't be any meetings in October, but there will be two meetings in November: Thursday, Nov. 1 and Thursday, Nov. 15, from 7:30 to 9:00 PM. Thereafter, meetings will be held on the third Thursday of the month, starting on December 20 from 7:30 to 9:00 PM. There may be occasional changes to this schedule, please consult the ONE LOVE SANGHA Facebook page for further information. One Love Sangha is a group created to be a refuge where people of color and comrades can come together in support and community of each other and find nourishment and inspiration in the teachings and practice of Buddhism. We come together monthly in a community effort to alleviate suffering by practicing and studying the dharma together as well as openly discuss our experiences living and navigating oppressive and biased social structures. The SpiritDoodle meditation group meets weekly at Clear Mountain Zen Center. This group is led by Chantel, and provides a good starting point for those who are new and unfamiliar with meditation. Meetings will be held on a weekly basis, on Friday mornings from 9:30 AM to 10:30 AM. Note -- this group is not formally associated with Clear Mountain Zen Center, but shares the Zen tradition's dedication to meditative practice. For further information, contact Chantel at: chantel@spiritdoodle.com or call 973-400-9151. Also see spiritdoodle.com. 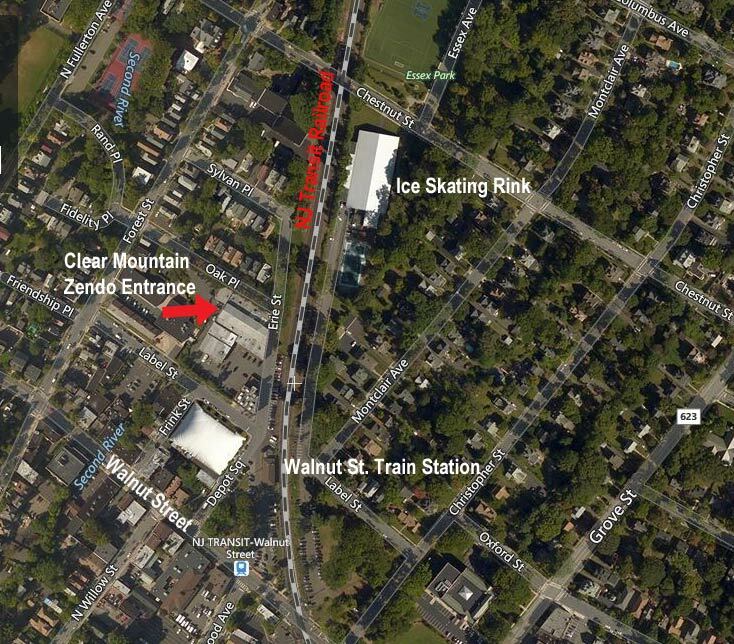 The North Jersey Wing Chun Training School meets every Tuesday evening from 7 to 9PM at Clear Mountain Zendo. This training, in the Kung Fu tradition, is led by Mike. It consists of guided body movement training along with skill and strength exercises, all integrated with meditation and self-reflection. There is a weekly fee for participation. Note -- this group is not formally associated with Clear Mountain Zen Center, but shares the Zen tradition's dedication to meditative practice. For further information, contact 302-364-6855. Also see www.northjerseywingchun.com. Sensei Carl's Note Regarding "The Meaning of Life"
Sensei Carl Bachmann contributed an essay on "The Meaning of Life" to Nicolae Tanase's "Excellence Reporter" web site. Here is the link to Sensei's thoughts. You can also hear Sensei's talk this past Sunday at Clear Mountain regarding life's meaning, and whether the idea of a "meaning to life" is even an important matter, at our web site using this link The Excellence Reporter is a collection of over 700 short and valuable essays on life from a wide variety of writers, thinkers, teachers, religious leaders, scientists, therapists, etc. The Clear Mountain sangha thanks Mr. Tanase for inviting our teacher to be a part of this wonderful resource to the world. The Clear Mountain Zendo facility is available at certain times throughout the week for short-term use by other small meeting groups with similar spiritual / community-service objectives. We require a fee for each use, but are willing to negotiate the payment amount based upon the group's mission and fiscal means. 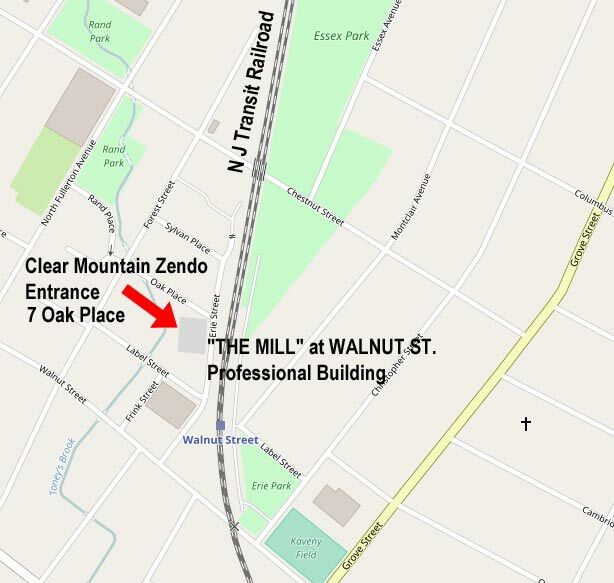 Our zendo is located in an office suite in "The Mill at Walnut Street" professional building downtown Montclair. Off-street parking is available after 7pm and on Sunday. Our space consists of several smaller rooms with the main meditation hall in the center (this area is carpeted). Bathrooms are available in the office building hallway; refrigeration and food warming are not available. Several electrical outlets are available to power small-sized computer devices, recording devices or visual presentation devices. Approximately 10 folding chairs and a small folding table can be utilized (although the group can bring its own additional chairs or tables as appropriate for the space available – but storage before or after meetings would not be available). Sitting cushions are also available for meditation or floor-level group discussions. The space would accommodate groups of up to 25 people. It would be appropriate for meditation sessions or similar small spiritually-oriented meetings or classes, counseling or discussion groups, etc. Any usage would need to be relatively quiet, i.e. no loud music, speech, public address systems, or other high-volume activity, in consideration of our setting amidst other building tenants. We are willing to discuss both one-time and regular usage, based upon time availability. If interested, please e-mail us for more information at contact@clearmountainzen.org. Please let us know in the e-mail how and when to contact you for further discussion. Our practice study circle continues to discus various chapters from the book "Buddha's Daughters" concerning the writings of modern women teachers. We continue to examine various writings and teachings by women teachers in modern Buddhist literature. Our sangha holds a practice circle during the 4th sitting period (from 10:30 to 11:00 am on Sundays), usually twice each month.